With the investigation into the death of Viola Turner still very much unsolved, Penn Cage finds that his father, Dr Tom Cage, may have been involved in more than some Ku Klux Klan killings. An FBI cold case team, of which agent John Kaiser is a member, have linked the Double Eagles with one of the most well-known killings in American history, and are keen to pursue it while the momentum is good. It’s an approach that doesn’t suit Penn’s immediate need to get his father to safety, and with the leader of the Double Eagles about to take control of the Louisiana State Police, that’s looking less likely by the minute. There is one lead, a lead of almost mythical proportions: a tree in the swamp where there is enough evidence to convict all of the Double Eagles and solve one of America’s greatest mysteries, and Penn’s girlfriend, Caitlin Masters, will stop at nothing to find it. The Bone Tree picks up immediately where Natchez Burning left off, dropping the reader back into the middle of the action as if we’d never been away. There are plenty of reasons to be excited about jumping back in: the murder of Viola Turner is still unsolved; we’ve been learning more and more about the past of Dr Tom Cage, and with luck there should be plenty more to come; and while the epic stand-off that closed book one is now in the past, there are still plenty of bad guys to keep Penn and his motley band of crusaders very much on their toes. It’s an excitement that lasts for only a short while, I’m sorry to say. While The Bone Tree takes us back to Natchez, Mississippi, a small town where so many questions have been left unanswered, it isn’t long before Iles sets out a new agenda for this second book in the series. The murder of Tom Cage’s old nurse takes a backseat along with the murders committed by the Double Eagles during the 1960s, and The Bone Tree becomes, to all intents and purposes, a second-rate Kennedy assassination conspiracy thriller. It is, to say the least, something of an anti-climax after the pulse-pounding Natchez Burning. Couple this with the fact that the main characters become much less likeable the more time we spend in their company, their selfishness overriding any of the other qualities they may have had – particularly Penn and Caitlin – to the extent that they become almost like sulky children playing at adulthood. Which is not to say that The Bone Tree is a bad novel. It’s just not the excellent novel that it should have been had Iles stayed on track and given us a proper follow-up to Natchez Burning. As the book ends, 850 pages later, we find that we’re none the wiser about any of the questions raised by the first book in the series: who killed Viola Turner? No idea. What’s the deal with Tom Cage and his strange and incriminating silence? No idea. Are we likely to find out in the next book? Frustratingly, no idea, because who knows where Iles will take the story next? The book does have some glimpses of brilliance: the scenes at the Bone Tree are chilling and affecting, enough to bring a shiver to even the most hardened of readers. 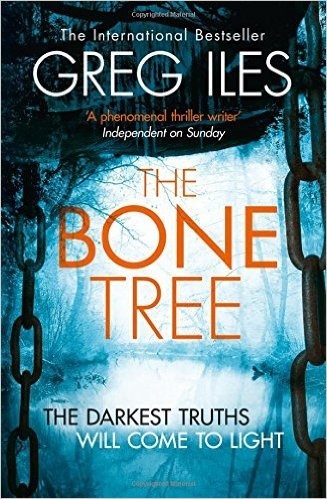 And Iles proves that he’s not all about the cliché, taking the unprecedented step of killing off key characters to advance the story – The Bone Tree racks up a main character body count that is worthy of Game of Thrones. It’s just a shame that the Kennedy assassination gets so much attention, and the original story becomes little more than a series of sub-plots to round out the page count. In many ways it feels like The Bone Tree could be skipped without losing much momentum on the overall story, though it’s probably just about worth the read for the aforementioned glimpses of brilliance. Iles has a lot of work cut out for himself in book three to make us care about the central characters again, and it’s likely that many readers will only return to the trilogy’s final volume to get the answers to the questions that we expected to find in The Bone Tree. In short, it’s a disappointing novel that has the potential to wreck what could have been an excellent trilogy.